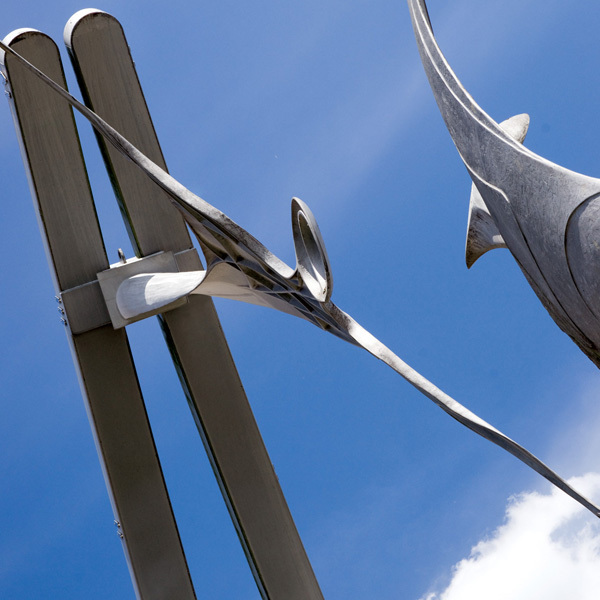 Made of cast aluminium and steel, the sculpture is sixteen metres tall, located at South Waterside, Lincoln. The work was commissioned following an open competition to create a new piece of artwork for this specific location in Lincoln. Inspired by blades of a gas turbine, this sculpture of celebratory stylised figures is to celebrate the Millenium. Within the work, the turbine blades transform into figures that reach out, but do not touch, to empower one another, like the blades empower one another within the turbine. On one side there is a large ‘ring’ structure for the public to walk through. On the other bank a single arched cantilever structure stretches across the river. This sculpture is part of Lincoln City Council’s Estate/Assets. Purchased by the Heslam Trust with Alston Power, Arts and Business, Ruddocks, The Co-operative, and Jackson Building Centres (2002). Stephen Broadbent is a Liverpool based sculptor specialising in public art. In the early 1990’s he established ‘Broadbent’ a creative design company to develop and respond to the challenge presented by the development of urban landscapes, corporate and domestic interiors.